Crafts and sports come together with the incredibly clever football tape from Magis. The roll of tape, which grabbed our attention at recent New York design show ICFF, is printed with a soccer ball pattern so you can instantly make a ball by wrapping it around crumpled up newspapers — or as the designer suggests — sports magazines. The simple concept presents a fun way to show your kids how to repurpose paper from your recycle bin and make something new to play with all at the same time! This DIY project isn’t going to yield a regulation ball by any means, but the ability to build a ball on the fly MacGyver-style with a roll of tape and some scrunched up paper gives reason to throw the rules aside. And, if you can conquer this feat spur of the moment at the park when the ball was left at home, you’ll earn super mom status just as fast as you can get the kids kickin’. The wherever, whenever aspect is exactly what Spanish designer Marti Guixe was going for with the football tape. His creations often push the traditional thoughts of function and encourage playful engagement rather than admiration. The black-and-white-printed tape isn’t Guixe’s first experiment with tape. He also created a roll of tape designed to look like an ornate golden picture frame. Crafts and sports come together with the incredibly clever football tape from Magis. 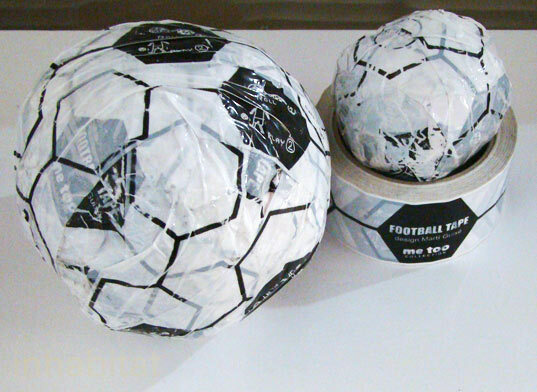 The roll of tape, which grabbed our attention at recent New York design show ICFF, is printed with a soccer ball pattern so you can instantly make a ball by wrapping it around crumpled up newspapers -- or as the designer suggests -- sports magazines. The simple concept presents a fun way to show your kids how to repurpose paper from your recycle bin and make something new to play with all at the same time!